Her name is Green, she is alone in a world that doesn't belong to her. She is a female orangutan, victim of deforestation and resource exploitation. This film is an emotional journey with Green's final days. It is a visual ride presenting the treasures of rainforest biodiversity and the devastating impacts of logging and land clearing for palm oil plantations. Green received 40 prizes in Festivals all around the world. 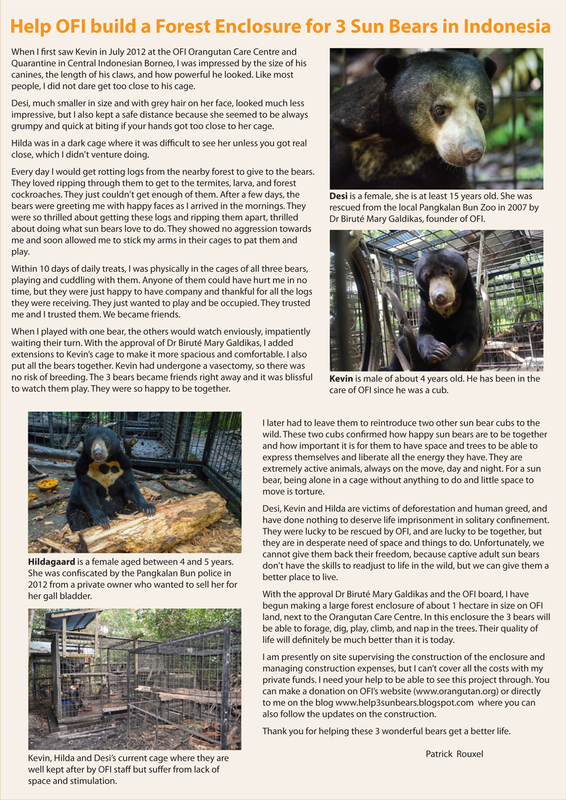 The return to life in the wild for 3 captive sun bears. A short fundraising film for the making of a large forest enclosure for three sun bears in Indonesia. The construction of the enclosure is a project I am presently personally supervising. It will hopefully be complete in May 2014. A short educational film for the Indonesian public on the Sun Bears. This film was commissioned by the KWPLH (Kawasan Wisata Pendidikan Lingkungan Hidup) to be screened at their site next to Balikpapan in East-Kalimantan where school children and visitors come to see sun bears in a forest enclosure and to learn more about the species. A short campaign film to help put an end to the use of “dancing macaques” in Indonesia. This film was commissioned by JAAN (Jakarta Animal Aid Network) to be shown on You-Tube. The purpose was to encourage people to sign a petition stating that they were against such practices. A musical clip commissioned by the WWF Gabon to help raise awareness on environmental protection. Eight independent French speaking Gabonese singers participated in the recording of the song and the shooting of the clip. A poetical film on the beauty of the Amazon forest and the harsh impact of the cattle and soy industries. The film focuses on the double crime behind the cattle industry: on one hand, the deforestation to make way for pastures and on the other, the daily merciless slaughter of cows by the thousands. Alma is a self-produced film allowing it to brake away from the conventional documentary format. A short film to help protect a beautiful patch of forest in the Congo. This film was commissioned by the WWF in their campaign to persuade the authorities of Congo-Brazzaville to prevent the logging of a forest that still holds gorillas, chimpanzees and elephants. The film follows a group of forest fire fighters from Nova Bandeirantes, MT Brazil, on a normal day’s work. It was made for the Brazilian audience to promote the work of the IBAMA Prevfogo brigades: men and women dedicated to protecting the Amazon from the flames. The film follows a group of high school students from San Paolo, Brazil, on a two weeks workshop on socio-economic development and rainforest conservation in the region of Alta Floresta, Mato Grosso. The film was made to support the workshops of the Escola da Amazônia. A poetical film on the deforestation in Indonesia and the extinction of the orangutans. The film tells the story of a female orangutan named Green who has lost her home, her child and her will to live. The story is told from Green’s point of view, without a word. This is a self produced film which brakes free from the conventional documentary to find itself halfway between fiction and documentary. A film on the forest of Minkebe in Gabon, to help protect it from poachers and logging. This film was commissioned by the WWF Gabon, both to raise awareness on the plight of the elephants who are being decimated for their tusks, and to promote the efforts of the eco-guards dedicated to the protection of the Minkebe forest. An open letter to the President of Indonesia based on the reactions of the students, teachers and villagers after watching Losing Tomorrow. This film was commissioned by GAFI (Great Apes Film Initiative) that organizes screenings of conservation films in remote places hit by environmental problems. A film on the biodiversity of the Indonesian rainforest and an insight into the logging, pulp and paper, and palm oil industries. Losing Tomorrow is a self produced film with a poetical first half and a more classical second half. The film is in fact a 52 minutes version of my film called Tears of Wood. Video Guide to Independent Forest Monitoring - 19 min - 2005 - Global Witness A film to train explain to the way Independent Forest Monitoring is carried out in third world countries. This film was commissioned by Global Witness and is set in Cameroun. Tears of Wood - 26 min - 2004 - Tawak Pictures A poetical film on the Indonesian rainforest and the orangutans. The camera follows a dominant male orangutan in the forest and shows the amazing biodiversity that surrounds him. A silent film where the camera takes the orangutan’s point of view. This is a self produced film, thus free in its expression. It is my first film.